It's really interesting, and there are two other clips here and here to check out. The second clip has a little bit, ehhhm, "extra" and more contemporary that reveals some of the poster's motives. Also, check out the comments on the clip I embedded (double-click to open it in YouTube, or here)- it's a gloves off flame war between some Iraqi and Iranian commenters. Oh! 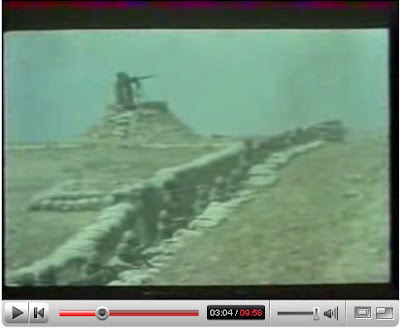 Check out this machine gun emplacement at 3:04. Were they really designed like that? What's the point- make them the best target possible? Does Anyone Remember KINO VERITE? (4) April 10, 2003 (Iraqi Ambassador to the UN, Mohammed al-Douri). It’s a Sunday afternoon in Baghdad on March 23, 2003, and along the banks of the Tigris River near al-Tahrir Bridge hundreds of Iraqi police are searching for what they think are two downed American pilots. Witnesses said that earlier they had seen parachutes fall near the west bank of the river. A large crowd has gathered and in a frenzy the police are setting the bushes on fire and shooting at eddies in the brown, muddy waters of the Tigris. Police armed with AK-47s are also now patrolling in boats. At the U.S. Central Command in Qatar, Army Lt. Gen. John Abizaid denies that any coalition planes had been shot down. "No planes have been shot down. No pilots have parachuted," he says. "You can see by their actions -- shooting into the water -- that their search-and-rescue techniques leave a lot to be desired," he adds. Civilians have now joined the search, some of them pouring gasoline on the reeds. One man tosses a match but is too close and the cuff of his pants catches on fire. He hops up the bank, his face red and grimacing. In the distance we can hear occasional explosions and above hang dark clouds from the burning oil trenches that circle the city. That day I had watched the search for the downed pilots for a few hours live on TV and then read the articles were written over the next couple days. It’s a Wednesday afternoon on April 9, 2003, and Igor Ivanov, the Russian Foreign Minister, is standing in a lobby of the United Nations in New York. He is standing by himself, cigarette in hand, and he notices that everyone in the lobby has turned to look at the television monitor. Everyone has stopped talking. Ivanov looks up at the screen and watches the Iraqis with the help of the American soldiers pull down the statue of Saddam Hussein, painfully reminding him of the many statues of Lenin that have been pulled down in Russia since December 25, 1991. How quickly things change, he thinks, recalling something Mikhail Gorbachev once told him. After Gorbachev had given his speech that December day ending the Soviet Union, he left his office and, as he was walking down the corridor, he happened to look out the window and was shocked to see the soldiers already pulling down the Soviet flag and hoisting the Russian flag. It could not have been more than a minute after my speech, Gorbachev had told Ivanov. On April 9, 2003, I was watching one of the cable news channels following the stunning events in Baghdad and they had one of their cameras in an area at the United Nations where diplomats could watch an overhead television screen. I spotted Ivanov in the crowd and watched him looking at the screen -- arms folded, hand to chin, eyes expressionless, if I recall correctly -- as the Iraqis and Americans worked to pull down Saddam's statue. It was one of those great moments in history and to see it happening through the eyes of the Russian Foreign Minister was especially fine. They had been invested, to some degree, in an American defeat. The observation from Gorbachev is recounted in David Remnick's Lenin's Tomb: The Last Days of the Soviet Empire. It’s a Wednesday afternoon on April 9, 2003, in the Al-Sadr neighborhood of Baghdad and a middle-aged journalist from New Zealand named Peter Arnett climbs out of a taxi with two Iraqi friends. They are across the street from the Al-Ardalea Mosque, which had been closed down the previous five years. Arnett and the two Iraqis stand and watch as a crowd begins to gather. At first there were around twenty, but soon the numbers swell to easily over a hundred. They start chanting, “Allahu Akbar!” and “Down with Saddam Hussein!” One of the members of the crowd raises an Islamic flag and starts marching around with it. Then the crowd notices the New Zealander across the street and they suddenly surge across the street in his direction. “Hey... this is it,” he thinks. Curtains. I had followed Peter Arnett's story closely throughout the war. I e-mailed MSNBC and complained about his interview of Saddam Hussein and his comments to him. According to my wife, the announcers at MSNBC responded directly to my e-mail and told me that they took my comments seriously. He would be fired not too much later. It’s a Thursday evening on April 10, 2003, in New York City and Mohammed al-Douri, Iraqi ambassador to the UN, is standing next to the open door of the black limousine that will shortly take him to JFK Airport and out of the United States. Reporters are gathered around him and his face is bathed in the bright lights from the video cameras. Over the build-up to and exection of the war in Iraq, one could not escape al-Douri's rather unpleasant visage at the United Nations. I watched live on TV as he made his last remarks to the press before climbing into the limo that took him to JFK. In the comments of the last post, the conversation turned again to the circumstances of the Abu Ghraib scandal. At that time, Lt. General Sanchez was the "General Petreaus". His military career essentially ended by that atom bomb. 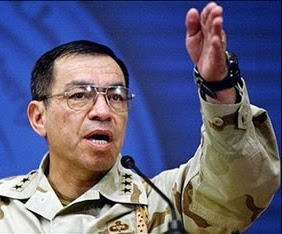 Sanchez's leadership was not found to culpable, but that was irrelevant to those who thought the scandal besmirched the entire Iraq mission. Their only complaint was that the blame didn't go high enough. I'll say no more about Abu Ghraib except to note that the Army (under Sanchez's command) uncovered the criminal misbehavior of 19 military police working the nightshift. It investigated their crimes. It began prosecution against 6 of those soldiers from Nov. 2003 until April 2004 when, with the help of some treacherous journalists, and a stupid, ornery relative of the one of the miscreants, the infamous photos were broadcast around the world without the least accompanying honest context. You can read the whole story here. There is no question that America is living a nightmare with no end in sight. Since 2003, the Politics of War have been characterized by partisanship as the Republican and Democratic parties struggled for power in Washington. National efforts, to date, have been corrupted by partisan politics that have prevented us from devising effective, executable, supportable solutions. Some of you may not believe this, but I am glad to be here When Sig asked me if I would consider addressing you, there was no doubt that I should come into the Lion's Den. This was important, because I have firmly believed since Desert Shield that it is necessary for the strength of our democracy that the military and the press corps maintain a strong, mutually respectful and enabling relationship. This continues to be problematic for our country; especially during times of war. One of the greatest military correspondents of our time, Joe Galloway, made me a believer when he joined the 24th Infantry Division during Desert Storm. I will provide you some thoughts on the current state of our war effort. ...immediately come to mind. They exemplify what America should demand of our journalists: tough reporting that relies upon integrity, objectivity, and fairness to give accurate and thorough accounts that strengthen our freedom of the press and in turn our democracy. "The most inexperienced Lt. General"
In some cases, I have never even met you, yet you feel qualified to make character judgements that are communicated to the world. My experience is not unique, and we can find other examples such as the treatment of Secretary Brown during Katrina. This is the worst display of journalism imaginable by those of us that are bound by a strict value system of selfless service, honor, and integrity. Almost invariably, my perception is that the sensationalistic value of these assessments is what provided the edge that you seek for self-agrandizement or to advance your individual quest for getting on the front page with your stories. As I understand it, your measure of is how many front page stories you have written and, unfortunately some of you will compromise your integrity and display questionable ethics as you seek to keep America informed. This is much like the Intelligence Analysts whose effectiveness was measure by the number of intelligence reports he produced. For some, it seems that as long as you get a front page story, there is little or no regard for the "collateral damage" you will cause. Personal reputations have no value and you report with total impunity and are rarely held accountable for unethical conduct. Given the near instantaneous ability to report actions on the ground, the responsibility to accurately and truthfully report takes on an unprecedented importance. The speculative and often uninformed initial reporting that characterizes our media appears to be rapidly becoming the standard of the industry. Once reported, your assessments become conventional wisdom and nearly impossible to change. Other major challenges are your willingness to be manipulated by "high level officials" who leak stories and by lawyers who use hyperbole to strengthen their arguments. Your unwillingness to accurately and prominently correct your mistakes and your agenda-driven biases contribute to this corrosive environment. All these challenges combined create a media environment that does a tremendous disservice to America. Over the course of this war, tactically insignificant events have become strategic defeats for America because of the tremendous power and impact of the media and, by extension, you, the journalist. In many cases the media has unjustly destroyed the individual reputations and careers of those involved. We realize that because of the near real time reporting environment that you face, it is difficult to report accurately. In my business, one of our fundamental truths is that "The First Report Is Always Wrong." Unfortunately, in your business "The First Report" gives Americans who rely on the snippets of CNN, if you will, their "Truths" and perspectives on an issue. As a corollary to this deadline driven need to publish "initial impressions or observations" versus objective facts, there is an additional challenge for us who are the subject of your reporting. "Public enlightenment is the forerunner of Justice and the Foundation of Democracy. The duty of the journalist is to further those ends by seeking Truth and providing a fair and comprehensive account of events and issues. Conscientious journalists from from all media and specialties strive to serve the public with thouroughness and honest. Professional integrity is the cornerstone of a journalist's credibility. All are victims of the massive agenda-driven competition for economic or political supremacy. The death knell of your ethics has been enabled by your parent organizations who have chosen to align themselves with political agendas. What is clear to me is that you are perpetuating the corrosive partisan politics that is destroying our country and killing our servicemembers who are at war. My assessment is that your profession, to some extent, has strayed from these ethical standards and allowed external agendas to manipulate what the American public sees on TV, what they read in our newspapers and what they see on the web. For some of you, just like some of our politicians, the truth is of little to no value if it does not fit your own preconceived notions, bias and agendas. It is astounding to me, when I hear the vehement disagreement with the military's forays into information operations that seek to disseminate the truth and inform the Iraqi people in order to counter our enemy's blatant propaganda. As I assess various media entities, some are unquestionably engaged in political propaganda that is uncontrolled. There is no question in my mind that the strength of our democracy and our freedoms remain linked to your ability to exercise freedom of the press. I adamantly support this basic foundation of our democracy and completely supported the embedding of media into our formations up until my last day in uniform. The issue is one of maintaining professional ethics and standards from within your institution. Military leaders must accept that these injustices will happen and whether they like what you accept that these injustices will happen, and whether they like what you print or not, they must deal with you and enable you, if you are an ethical journalist. Who is responsible for maintaining the ethical standards of the profession in order to ensure that our democracy does not continue to be threatened by this dangerous shift away from your sacred duty of public enlightenment? Let me now transition to our current national security condition. As we all know, war is an extension of politics and when a nation goes to war it must bring to bear all elements of power in order to win. Warfighting is not solely the responsibility of the military commander unless he has been given the responsibility and resources to synchronize the political, economic, and informational power of the nation. So who is responsible for developing the grand strategy that will allow America to emerge victorious from this generational struggle against extremism? After more than four years of fighting, America continues its desperate struggle in Iraq without any concerted effort to devise a strategy that will achieve victory in that worn-torn country or in the Greater Conflict Against Extremism. From a catastrophically flawed, unrealistically optimistic war plan to the Administration's latest "Surge" strategy, this Administration has failed to employ and synchonize its political, economic, and military power. The latest revised strategy is a desperate attempt by an Administration that has not accepted the political economic realities of this war and they have definitely not communicated that reality to the American people. An even worse and more disturbing assessment is that America cannot achieve the political consensus necessary to devise a Grand Strategy that will synchonize and commit our national power to achieve victory in Iraq. While the politicians espouse their rhetoric designed to preserve their reputations and their political power, Our Soldiers Die! Our national leadership ignored the lessons of World War II as we entered into this war and to this day continue to believe that victory can be achieved through the application of military power alone. Our forefathers understood that tremendous economic and political capacity had to be mobilized, synchronized, and applied if we were to achieve victory in a global war. That has been and continues to be the key victory in Iraq. Continued manipulations and adjustments to our military strategy will not achieve victory. The best we can do with this flawed approach is to stave off defeat. "Action without vision is a nightmare." There is no question that America is living a nightmare with no end in sight. Since 2003, the Politics of War have been characterized by partisanship as the Republican and Democratic parties struggled for power in Washington. National efforts, to date, have been corrupted by partisan politics that have prevented us from devising effective, executable, supportable solutions. At times, these partisan struggles have led to political decisions that endangered the lives of our sons and daughters on the battlefield. The unmistakable message was that political power had greater priority than our national security objectives. Overcoming this strategic failure is the first step toward achieving Victory in Iraq. Without bipartisan cooperation we are doomed to fail. There is nothing going on today in Washington that would give us hope. If we succeed in crafting a bipartisan strategy for victory, then America must hold all national agencies accountable for developing and executing the political and economic initiatives that will bring about stability, security, political and economic hope for all Iraqis. That has not been successful to date. Congress must shoulder a significant responsibility for this failure since there has been no focused oversight of the nation's political and economic initiatives in this war. Exhortations, Encouragements, Investigations, Studies, and Discussions will not produce success. This appears to be the nation's only alternative since the transfer of sovereinty. Our continued neglect will only extend the conflict. America's dilemma is that we no longer control the ability to directly influence the Iraqi institutions. The sovereign Iraqi government must be cooperative in these long-term efforts. That is not likely at the levels necessary in the near term. Our commanders on the ground will continue to make progress and provide time for the development of a grand strategy . That will be wasted effort as we have seen repeatedly since 2003. In the mean time, our soldiers, sailors, airmen, and marines will continue to die. Since the start of this war, America's leadership has known that our military alone could not achieve victory in Iraq. Starting in July 2003, the message repeatedly communicated to Washington by military commanders on the ground was that the military alone could never achieve "victory" in Iraq. Our soldiers, sailors, airmen, and marines were destined to endure decades of fighting and killing people without the focused, synchronized applications of all elements of national power. This was a necessary condition to stabilize Iraq. Any sequential solutions would lead to a prolonged conflict and increased resistance. By neglect and incompentence at the national security council level, that is the path our political leaders chose and now America, more precisely the American military, finds itself in an intractable situation. Clearly, mistakes have been made by the American military in its application of power, but even its greatest failures in this war can be linked to America's lack of commitment, priority, and moral courage in this war effort. Without the sacrifices of our magnificent young men and women in uniform, Iraq would be chaotic well beyond anything experienced to date. What America must accept as a reality at this point in the war is that our Army and Marine Corps are struggling with the deployment schedules. What is clear is that the deployment cycles of our formations has been totally disrupted, the resourcing and training challenges are significant and America's ability to sustain a force level of 150,000+ is non-exisitent without drastic measures that have been politically unacceptable to date. The drawdown of the Surge to pre-Surge levels was never a question. America must understand that it will take the Army at least a decade to fix the damage that has been done to its full spectrum readiness. The President's recent statement to America that he will listen to military commanders is a mater of political expediency. Our Army and Marine Corps will execute as directed, perform magnificently, and never complain. That is the ethic of our warriors and that is what America expects of them. They will not disappoint us. But America must know the pressures that are being placed on our military institutions as we fight this war. All Americans must demand that these deploying formations are properly resourced, properly trained, and we must never allow America's support for the Soldier to falter. A critical objective assessment of our nation's ability to execute our national security strategy must be conducted. If we are objective and honest, the results will be surprising to all Americans. There is unacceptable strategic risk. America has no choice, but to continue our efforts in Iraq. A precipitous withdrawal will unquestionably lead to chaos that would endanger the stability of the Greater Middle East. If this occurs it would have significant adverse effects on the international community. Coalition and American Force Presence will be required at some level for the foreseeable future. Given the lack of a Grand Strategy, we must move rapidly to minimize that force presence, and allow the Iraqis maximum ability to exercise their soverienty in achieving a solution. At no time in America's history has there been a greater need for bipartisan cooperation. The threat of Extremism is real and demands unified action at the same levels demonstrated by our forefathers during World War I and World War II. America has failed to date. This endeavor has further been hampered by a Coalition effort that can be characterized as hasty, unresourced, and often uncoordinated and unmanaged. Desperately needed, but essentially ignored, were the political and economic Coalitions that were the key to victory and stability in the immediate aftermath of the conventional war. The military coalition which was hastily put together in the Summer of 2003 was problematic given the multitude of national caveats, inadequate rules of engagement, and other restrictions on the forces deployed. Even so, the military Coalition was the most extensive, productive, and effective deployment of forces in decades. Today, we continue our inept Coalition management efforts, and, in fact, we are facing ever decreasing troop commitments by our military Coalition partners. America's "Revised" strategy does not address Coalition initiatives and challenges. We cannot afford to continue this struggle without the support of our Coalition partners across all elements of national power. [military, political, & economic] Without the political and economic elements of power complementing the tremendous efforts of our military, America is assured of failure. We continue on that path. America's political leadership must come together and develop a bipartisan Grand Strategy to achieve victory in this conflict. The simultaneous application of our political, economic, information, and military elements of power is the only coarse of action that will provide a chance of success. Achieving unity of effort in Iraq has been elusive to date primarily because there is no entity that has the authority to direct action by our interagency. Our National Security Council has been a catastrophic failure. Furthermore, America's ability to hold the interagency accountable for their failures in this war is non-existent. This Must Change. As a nation, we must recognize that the enemy we face is commited to destroying our Way of Life. This enemy is arguably more dangerous than any threat we faced in the 20th century. Our political leaders must place national security objectives above partisan politics, demand Interagency Unitity of Effort, and never again commit America to war without a Grand Strategy that embraces the basic tenets of the Powell Doctrine. It seems that Congress recognizes that the military cannot achieve victory alone in this war, yet they continue to demand victory from our military. Who will demand accountability for the failure of our national political leaders involved in the management of this war? They have unquestionably been derelict in the performance of their duty. In my profession, these type of leaders would immediately be relieved or court-martialed. America has sent our soldiers off to war and they must be supported at all costs until we achieve victory or until the political leaders decide to bring them home. Our political and military leaders owe the Soldier On the Battlefield the strategy, the policies, and the resources to win once committed to war. America has not been fully committed to Win This War. As the military commanders on the ground have stated since the Summer of 2003, The Military ALONE Cannot Win This War. America must mobilize the Interagency and the political and economic elements of power (which have been abject failures to date) in order to achieve victory. Our nation has not focused on the greatest challenge of our lifetime. The political and economic elements of power must get beyond the politics to ensure the Survival of America. Partisan Politics have hindered this war effort, and America should not accept this. America must demand a unified national strategy that goes well beyond partisan politics, and places the common good above all else. Too often our politicians have chosen loyalty to their political party above loyalty to the Constitution, because of their Lust for Power. Our politicians must remember their Oath of Office, and recommit themselves to serving our nation and not their own self-interests or political party. The security of America is at stake, and we can accept nothing less. Anything short of this is unquestionably dereliction of duty. These are fairly harsh assessments of the Military and Press Relationship, and the status of our War Effort. I remain optimistic and committed to the enabling of media operations under the toughest of conditions in order to keep the world and the American people informed. Our military must embrace you for the sake of our democracy, but you owe them ethical journalism. Thank you for this opportunity. May God bless you, and may God bless America. Praise be to the Lord My Rock who trains my fingers for battle, and my hands for war. On Tuesday, October 9, 2007, AQI and the insurgents in Iraq did not kill any Coalition forces. Not one. AQI and the insurgents did, however, murder 49 Iraqi citizens. On that same day, the security guards for Unity Resources Group, a Dubai-based, Australian-owned security company, fired their weapons upon a vehicle that had been speeding toward their convoy, the guards interpreting it as a car-bomb suicide attack. Tragically, two Iraqi Christian women were killed. Now which of these numbers and the events connected to them do you think upset Treasure of Baghdad the most? The 49 Iraqis targeted by AQI and the insurgents? Or the 2 women killed accidentally, perhaps recklessly so? I think you know the answer. Treasure of Baghdad said nothing about the 49 Iraqis killed by AQI. Like Al Jazeera, it seems, Arab-on-Arab killing isn't really worth talking about. According to Treasure of Baghdad, the contractors are the same as the terrorists. "They are no different than al-Qaeda and the militias," Treasure of Baghdad writes. "They all share [a] common motto: Kill the Innocent." This is the usual moral equivalency we have now come to expect from him: Al Qaeda = militias = security guards. Oh really, BT? Let's take a look at the numbers, okay? Since the beginning of 2005, almost three years now, Blackwater security guards have discharged their weapons 195 times. That means, in the last 34 months, the Blackwater guards have fired their weapons 5.7 times per month. They are responsible for the deaths of 17 Iraq civilians. There may be a few more who have died in the crossfire of the ambushes into which they sometimes drive. How about AQI and the insurgents? While Blackwater guards have fired their weapons 195 times, with perhaps 11 or 17 or maybe a dozen or two Iraqis killed, AQI and the insurgents have targeted and killed 44,241 Iraqi citizens. "They are no different than al-Qaeda and the militias," says Treasure of Baghdad. "They all share [a] common motto: Kill the Innocent." How do you say "hypocrite" in Arabic? UPDATE: In Arabic, "hypocrite" is "munafiq." And "hypocrisy" is "nifaq." Thanks to Exile-Iraqi and Mojo, I can now call Treasure of Baghdad a "munafiq." Listen, it's understandable for him to feel pain when his fellow countrymen and women die. In order for him not to a "munafiq," however, he needs to point out who is really targeting and killing tens of thousands of Iraqi citizens. Why doesn't he post about the suicide-bombers who killed so many Iraqis the last week on purpose? Treasure of Baghdad is also a "munafiq" because he deletes the vast majority of comments he doesn't agree with on his comments pages. It has nothing to do with trollish behavior or curses. It's the content that he doesn't approve of that is removed. Should Iraqi officials create new laws for the conduct of private security guards? Yes, indeed. I'm hoping after Ramadan we actually see the Iraqi Members of Parliament do more than just talk and actually try to pass legislation on this issue. At the same time, however, both the Blackwater and Unity Resources Group incidents, in my opinion, are being latched onto by Arabs who once again are trying to avoid responsibility for the carnage due to fanatical Arab Muslims who have been streaming into Iraq to blow up Iraqi citizens. It's similar to the photos of prisoner abuse that had occurred in Abu Ghraib. Those soldiers at Abu Ghraib, freaks that they were, never killed anyone. The very real torture and killing of prisoners that had gone on under the nearly three-decade Hussein tyranny isn't talked about very much within the Arab media. Why? It seems that Arab-on-Arab torture isn't newsworthy. Arab Muslims have killed tens of thousands of other Arab Muslims and Al Jazeera hums along. A Dane draws a cartoon and the Arab world goes nuts and calls for the cartoonist to be killed. On October 9 forty-nine Iraqi civilians were murdered by Arab suicide-bombers. On that same day, security guards for a private company trying to help rebuild Iraq fired upon a vehicle they assumed was a suicide car-bomber and two innocent Iraqi Christian women were tragically killed. Check the media. Which numbers are being talked about? UPDATE: How does AQI celebrate the beginning Eid al-Fitr? This isn't difficult to answer, is it? Yep, an AQI suicide-bomber drove his bomb-laden car into a group of Iraqi Muslims who were starting to enjoy their holiday, killing eight people and wounding twenty-five others. BAGHDAD -- A suicide bomber rammed an explosives-laden car into a cafe in the Iraqi capital on Thursday shortly after the Eid al-Fitr holiday began, killing at least eight people and wounding 25 others, officials said. The bomber struck at 9:00 pm (1800 GMT) as young men were relaxing at the cafe as the Muslim holiday started in an area called New Baghdad in the southeast of the city, interior and defence ministry officials said. The wounded, some in a critical state, were taken to the main Al-Kindi hospital in the centre of Baghdad, the officials added. Do you think Al Jazeera will condemn this? Do you think the imams will condemn this? Infoplease: Iraq Crisis, 2002-2007. Neutral in selection and presentation with occasional links. No photographs. Think Progress: A Timeline of the Iraq War. Iraq war from a left-wing, anti-war perspective. Each entry has a corresponding link to a news article. Very good selection of photographs. The last entry, however, is from June 26, 2007. It seems that the surge has silenced the Think Progress updates as well as it has frustrated more than a few members of Congress. NPR: The Toll of War. History of Iraq War over the last five years by using monthly statistics of Coalition fatalities and Iraqi Security Force and civilian casualties. Attractive layout. Mother Jones: Lie by Lie: The Mother Jones Iraq War Timeline (8/1/90 - 6/21/03). My favorite timeline title so far, ranking first in the tendentious category. Colorful. If anyone finds any other timelines that they think should be included in our list here, paste the link in a comment and I'll punch it up onto the front page. Here's a timeline of sorts for the history of the Iraqi blogosphere (from an old IBC blog entry). Iraq is not a poor country. Flying over the Tigris-Euphrates valley (I speak now a farmer) is unlike anything in Kuwait or Saudi Arabia. The soil is rich, the water plentiful and the dry climate perfect for intensive agriculture. That the country in theory within a year or two could pump well over three million barrels of petroleum a day, gives some indication of just how badly Iraq has been run the last forty years to screw up such natural bounty of a country—the Baathist-terror state, the attack on Iran, the massacres of Kurdish and Shiite innocents, the 1991 Gulf War, the no-fly zones and UN embargo, et al. If only the Iraqi politicians could accept to share the land's bounty equally. Is this possible?